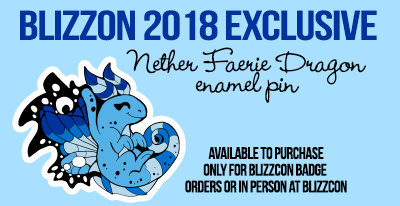 Blizzcon Badges for 2018 are now open! Badges are currently closed, but may reopen later this summer. Check twitter for updates! More commonly known as a ConBadges, these are meant to be worn at conventions and gatherings! These can be of a character, online persona, OC, or maybe just a characterization of yourself in real life and your screenname. Its meant to show off who you are and let others easily recognize you.. also they’re just pretty cool to have. 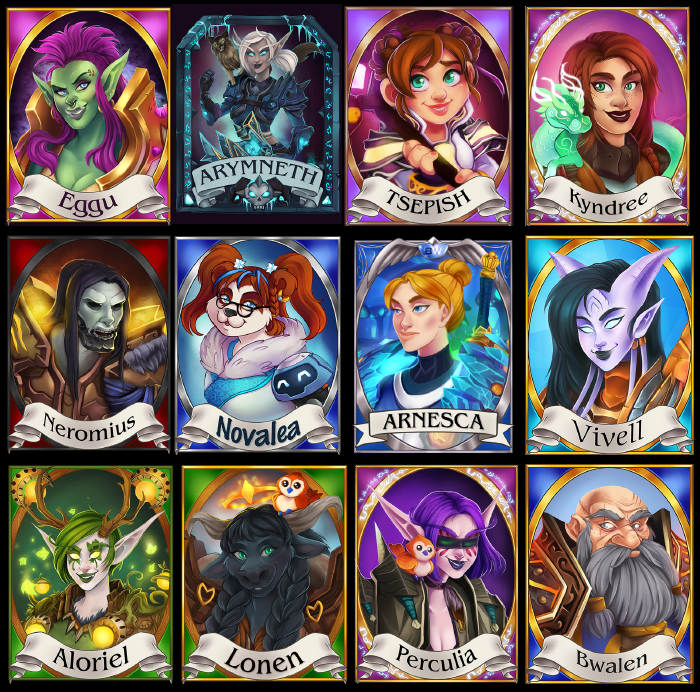 While I’ve tailored these mostly for Blizzcon and World of Warcraft characters, you can use these for almost any game or convention you plan to attend. When do you open? Where/How do I order? Badges are set to open May 11th at 12pm EST, and the form will remain open for one week. Slots this year will be a little different, and chosen by lottery. I plan to do 5-10 slots at a time, and continue to do batches until I no longer am able to due to time constraints. More questions? head over to the FAQ or contact me. Badges are about 3.5×4.5″, though actual size may vary slightly due to cutting. All badges for 2018 will be printed on plastic and will not be laminated. They will be backed with cardstock, signed, and will include a metal clip to attach to a lanyard. For 2018, I am offering chibi emoji style badges. Artwork is done at 8.5×11″ at 300dpi resolution and you will receive the digital files (with and without badge borders) when finished! All badge orders will also include a small assortment of extra 2017 exclusive goodies, like a 5×7 print, a bookmark, stickers, a button featuring your character! There are also several paid upgrades that are exclusive to Blizzcon 2018 that you can order. Base price for all Badges is $30. Various extras can be added for an additional fee. 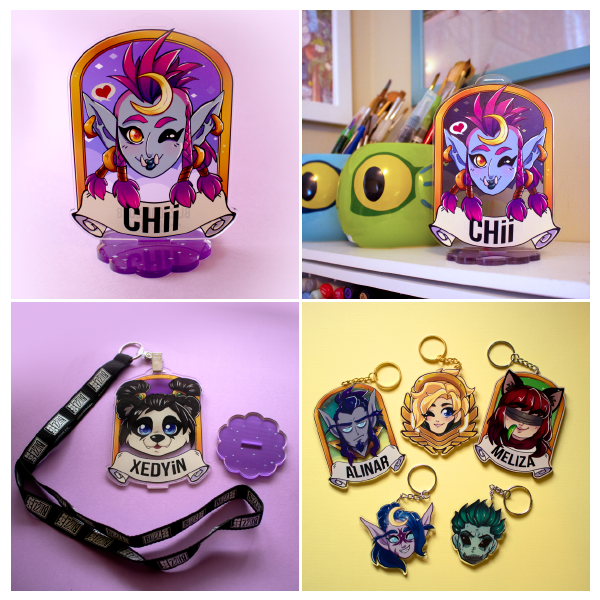 Shipping is $5 ($10-12 for international) but you will also have an option to pick up your badge at the convention for free. All badges and prints will be shipped flat in a bubble mailer backed with cardboard and will include a tracking number. Once submitted, you should receive a confirmation email. 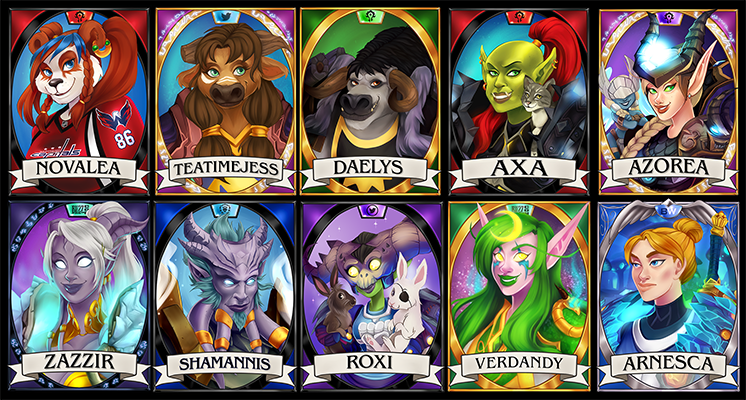 All badge slots are done via lottery, and I will pull 5-10 names at a time and work in batches. When your name is pulled, you will be emailed and sent a paypal invoice. All payments must be paid in full before work can begin. Turn around time is projected to be about 6-8 weeks per batch, but this may change. 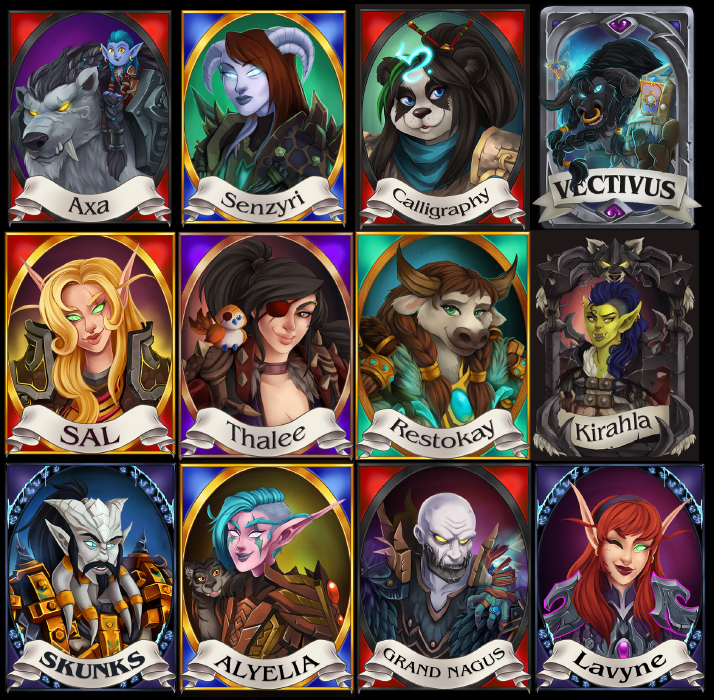 All badges will be shipped no later than 1 month before Blizzcon. 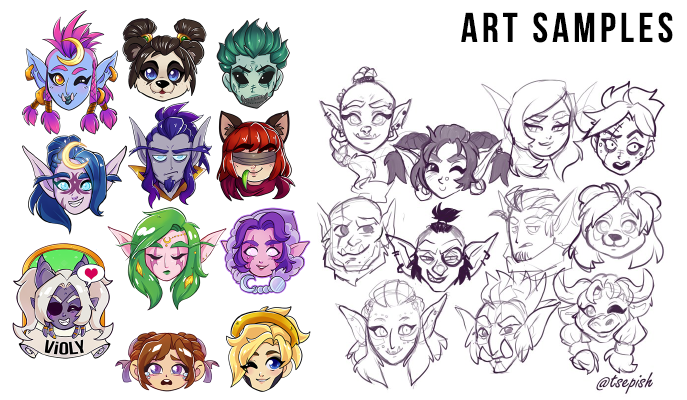 You will be updated on the progress of your badge at the sketch stage and the flat color stage and given the opportunity to review the image and make adjustments if needed. After completion you’ll receive the full resolution digital files, and once the entire batch is done they will be printed and mailed out. Want a badge like this instead? Keep an eye out for the Convert to Raid (@ConverttoRaid) Kickstarter for a chance to get one! I’ll also be offering 1 as an auction later this fall!